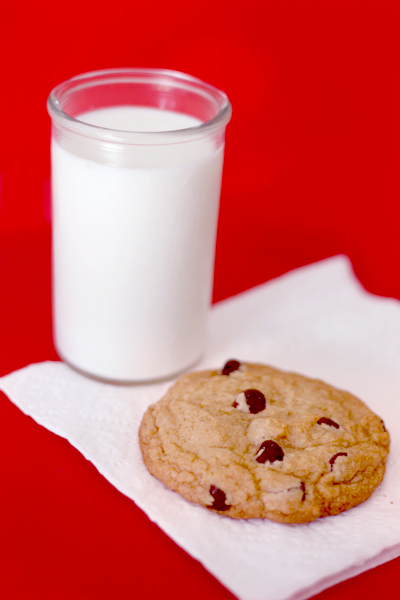 CCCs, more commonly know as Chocolate Chip Cookies, are crowd pleasing cookies. I don't think I've ever met someone who said no to a chocolate chip cookie. 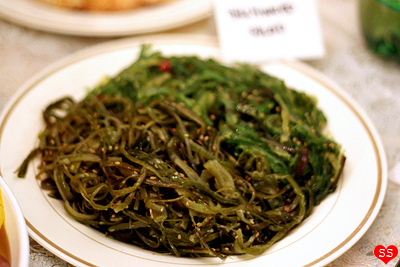 They appeal to to the tastes of many, aren't too difficult to make, and can be made big or small, depending on what you prefer. Chocolate chip cookies come in a variety of different textures. 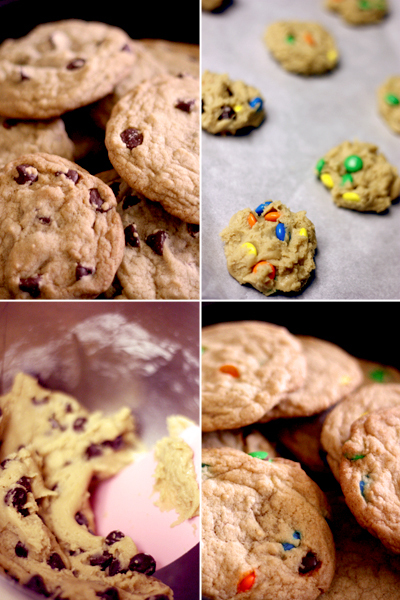 These recipes all use the same basic ingredients, but it's the ratio of these ingredients that determines whether the cookies will be cakey, chewy, or crisp. I happen to like chewy cookies, so back when I first started baking, I tried out many CCC recipes to find the perfect cookie: one with golden, crisp edges and soft, chewy centers. But for some reason, none of those cookies were the least bit chewy. I finally found success when I discovered Cook's Illustrated's Thick and Chewy Chocolate Chip Cookie. 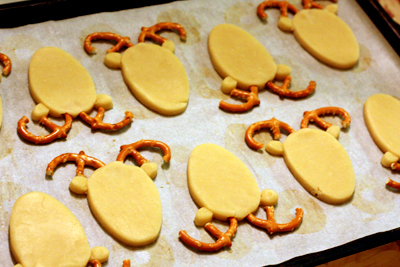 Another great thing about these cookies is that they are quite adaptable. Semisweet chocolate chips can be substituted with milk chocolate chips, white chocolate chunks, peanut butter chips, butterscotch morsels, M&Ms, mini peanut butter cups, or even coarsely chopped gourmet dark chocolate. 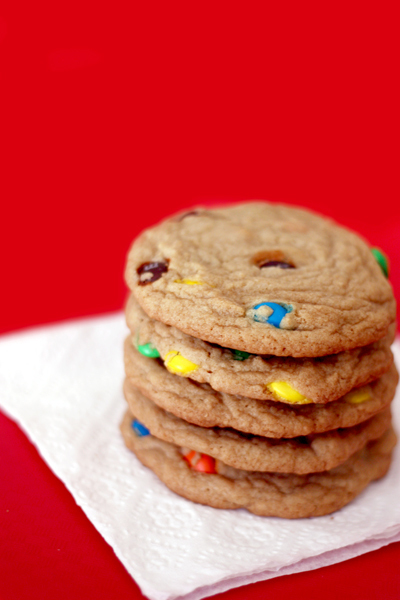 I typically like to mix in semisweet chocolate chips in one half of my dough and M&Ms into the other half. 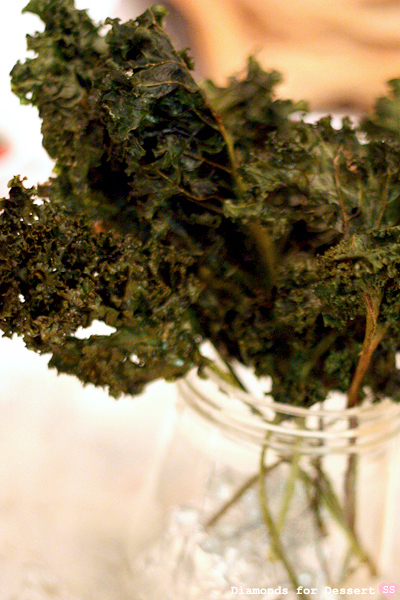 This recipe is the ultimate go-to recipe that I still use over and over today. One day during my recent winter break, I invited my friends over to watch the movie Amélie at noon. In order to be a good hostess, I needed, of course, to provide lunch (along with the promised crème brûlée). 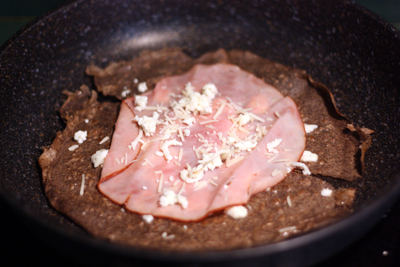 The day before, when I was deciding what to serve, automatically, I thought of crepes because I had some buckwheat flour sitting in the pantry. 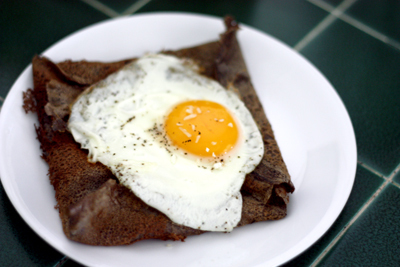 Buckwheat crepes, also known as galettes de sarrasin (made from buckwheat flour, farine de sarrasin), originate from Brittany. 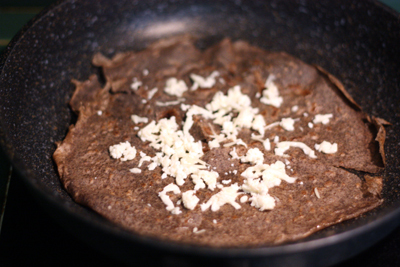 As opposed to crepes made from wheat flour, these buckwheat galettes have a a darker, speckled color and a pleasant, nutty flavor. 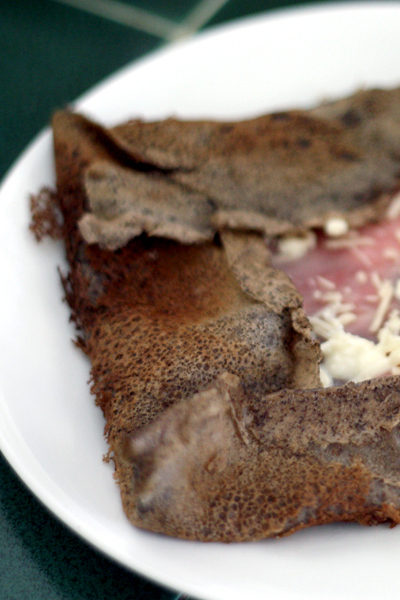 A great thing about serving these crepes, or just crepes in general, is that they can be filled with whatever you have on hand. This time, I chose to fill mine with ham, parmesan, and mozzarella, and then topped each of them off with an egg, runny-yolked, sunny-side up. But, I can think of a wide variety of fillings. I've also made them before filled with blanched spinach and gruyere. 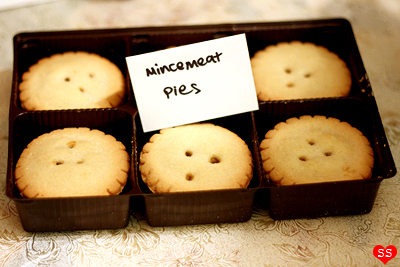 They can be filled with caramelized onions and chicken, leftover ratatouille, tuna, bacon, whatever you desire. "Amélie Poulain cultive un goût particulier pour les tous petits plaisirs. Elle aime plonger sa main au plus profond d’un sac de grain... briser la croûte des crèmes brûlées avec la pointe de la petite cuillère... et faire des ricochets sur le Canal Saint-Martin..."
One of my favorite movies happens to be Le fabuleux destin d'Amélie Poulain. It's a charming movie with an adorable love story, plenty of humor, witty dialogue, wonderful little details sprinkled throughout, beautiful background colors, a lovely cast (with the delightful Audrey Tautou starring as Amélie), and an enchanting music score. So, why am I singing praises about this film on a baking blog? 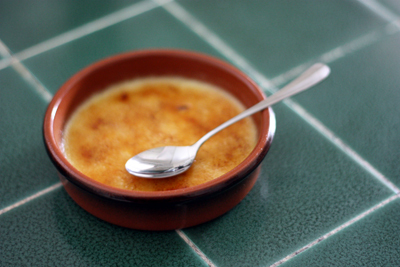 Well, a memorable thing about Amélie is that Amélie Poulain likes cracking the caramelized sugar crust on the top of crème brûlée with the back of a tiny spoon. 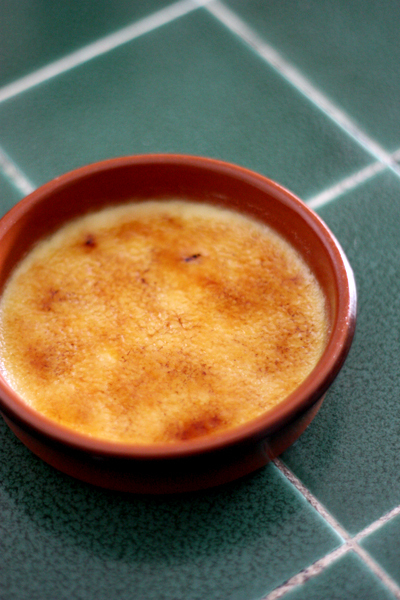 Breaking into the top of crème brûlée really is wonderful, from the sound of the cracking to the textural contrast between the rigid sugar shell and the luscious custard underneath. 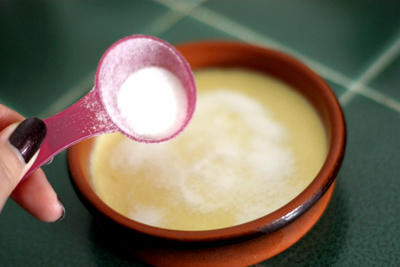 There are also two more super reasons for making crème brûlée. 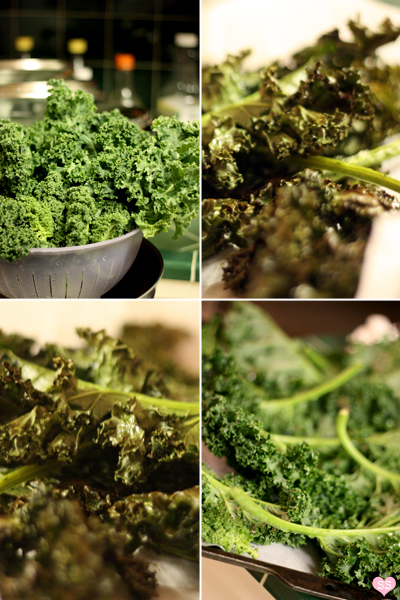 One, it's simple and only requires a few ingredients. 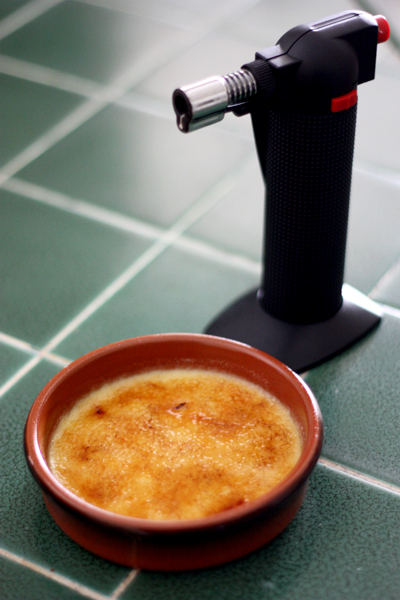 And two, you get to play with fire: torching the sugar is the best part! 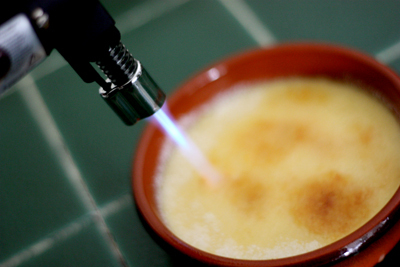 So next time, instead of going out and ordering crème brûlée at a restaurant, try your hand at making it from scratch. Oh, and if you haven't seen Amélie yet, definitely rent a copy sometime as well :D.
To finish with my Harry Potter party recipes, today I have two more recipes, one savory and one sweet: Cornish pasties and pumpkin pasties. 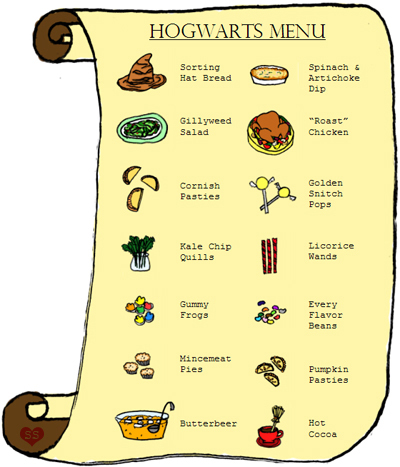 I remember back when I first read the Harry Potter books, I always wondered what pumpkin pasties looked like and how they tasted. Well after having made them, now I know :). 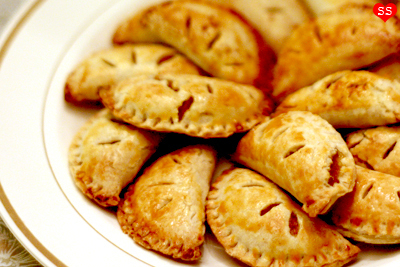 Pumpkin pasties are like mini pumpkin pie bites, pleasant little after dinner desserts. 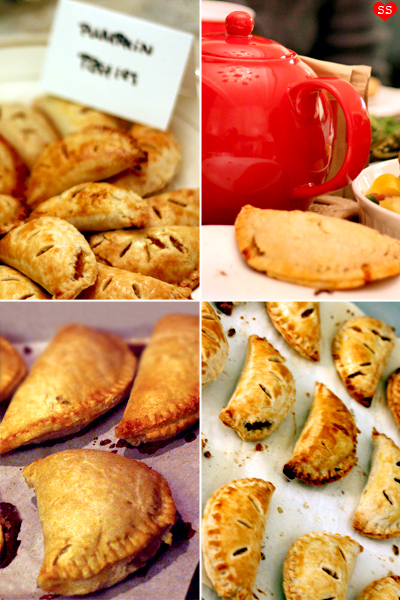 Cornish pasties, on the other hand, are more of a during the main feast kind of dish. And no, they don't contain corn (many of my friends asked about that before eating them, I think they originated in Cornwall); they're flaky hand pies filled with beef and onions. 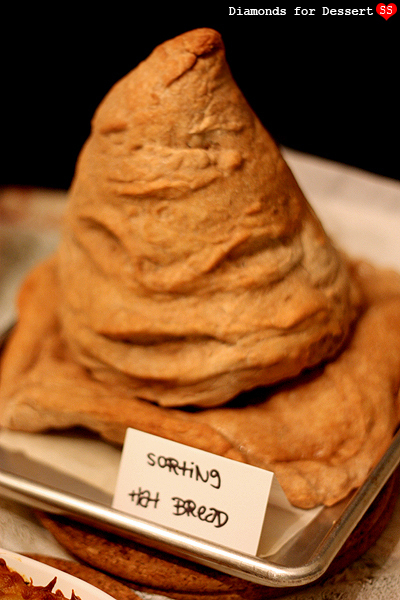 As I was brainstorming ideas for my Harry Potter party, the idea of the Sorting Hat made out of bread popped up in my mind. I was intrigued by the thought of a hat shaped bread that my friends could tear pieces off of and eat with a dip of some sort. In part, I was inspired by the large cornucopia bread centerpiece I made for Thanksgiving two years ago and served with a soft cheese. 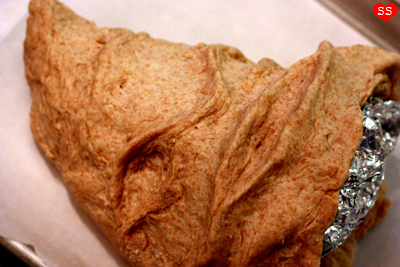 I needed a bread recipe that used whole wheat flour, which would give the dough a darker color. 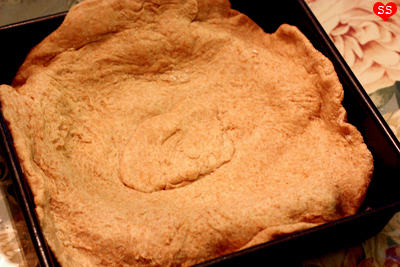 Also, the bread dough needed to be pliable and not expand too much while baking. 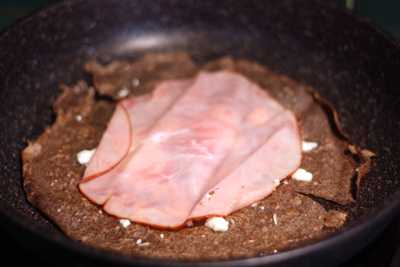 I decided on a pita bread recipe based on a memory of my attempt to make pita bread. I remembered that pitas contain ww flour and are easily shaped. I also knew from experience that when the pita breads aren't rolled out thin enough or if the oven temperature is too low, pitas don't puff up, which was bad for making pita bread, but perfect for my Sorting Hat idea. I tried it out on the day of the party, hoping it would work as I planned. I made the dough, shaped it, and baked it. It was a success! 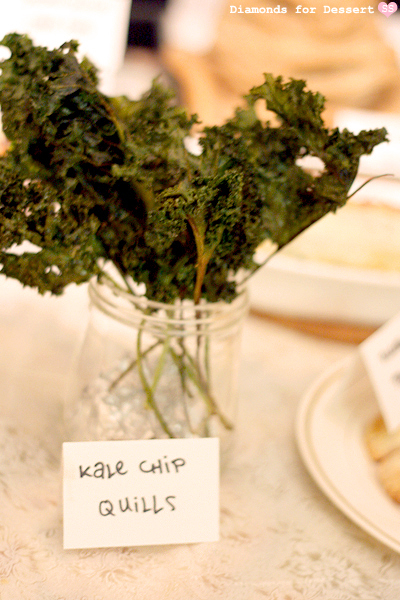 I chose to serve it along with a spinach and artichoke dip I made right before the party. 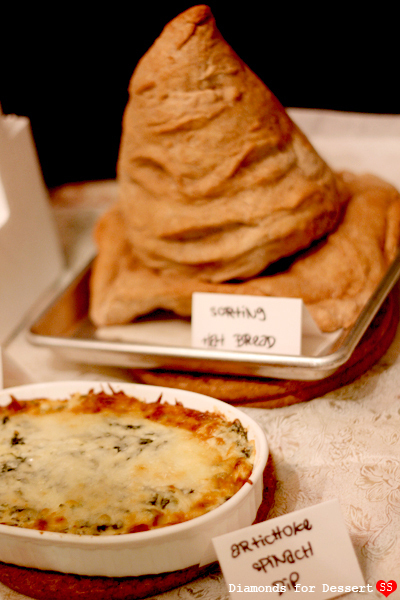 The Sorting Hat bread turned out to be quite an interesting but delicious dish at my Harry Potter feast. Last night, I was watching Harry Potter and the Prisoner of Azkaban on TV, which reminded me that I had some Harry Potter blogging to do (by the way, Harry Potter marathons seem to be on for the most random reasons... like House marathons, not that I'm complaining). 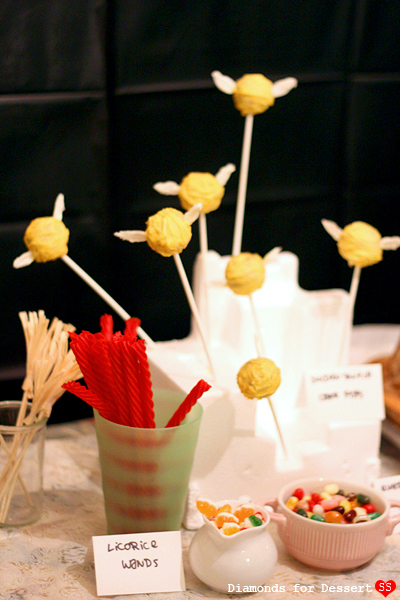 At last week's party, I served some golden snitch red velvet cake pops in the tiny "sweets" area of my dinner table, along with the candies I mentioned in my previous post. I couldn't figure out how to display the pops. I worried that their wings would chip off if they touched, so I left them stuck in the piece of styrofoam that I used for drying. 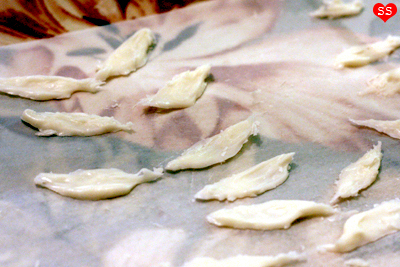 It turned out that they looked okay like that, almost as if they were buzzing around above the table. It was an eye-catching display to look at while dining :). 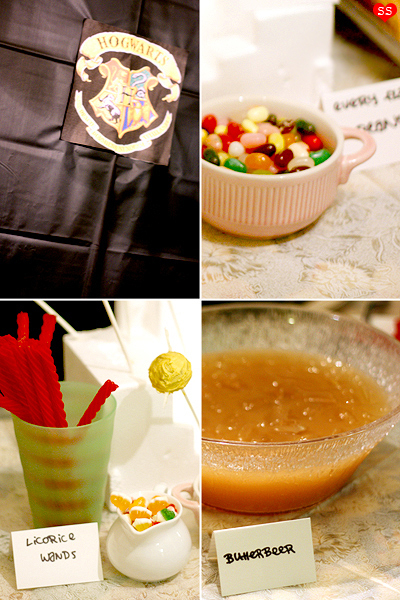 Last Wednesday, I held a Harry Potter themed party for my friends, a sort of pre-New Years celebration. A tad random, but what better way is there to start the New Year than by eating lots of Harry Potter food with friends? So... I'm crazy about themes. 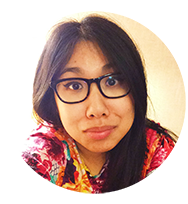 I'm someone who gets excited by holidays, seasonal changes, and anything else associated with a theme. Around Thanksgiving, I came up with the idea of having a Harry Potter party, inspired by 1) the Harry Potter party in the movie "Yes Man" (youtube clip at the bottom of this post, if you're curious) and 2) reading about the Wizarding World of Harry Potter theme park within a theme park that's set to open Spring 2010 in Universal Orlando (which I'm very very excited about). 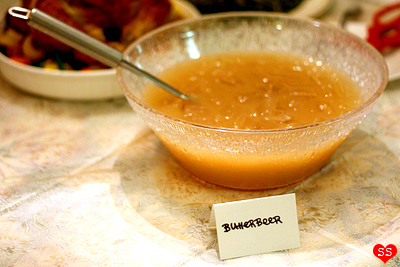 With ideas of drinking butterbeer and eating pumpkin pasties in real life floating around in my brain, I decided that it was very necessary that I throw this Harry Potter party. 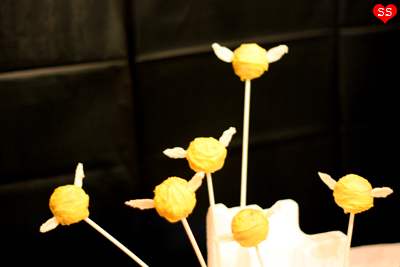 So in my next few posts, I'll be sharing with you Harry Potter themed recipes from my party, from a Sorting Hat shaped bread to Golden Snitch cake pops. 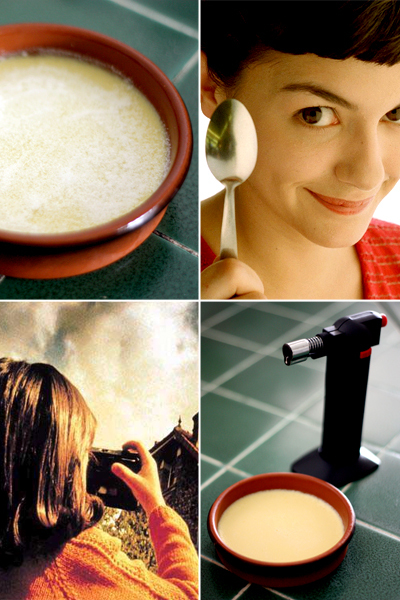 Today, I'll share with you the simplest but most easily recognized recipe of the bunch: Butterbeer. Happy New Year!!! My last Christmas post, I'm finally caught up. 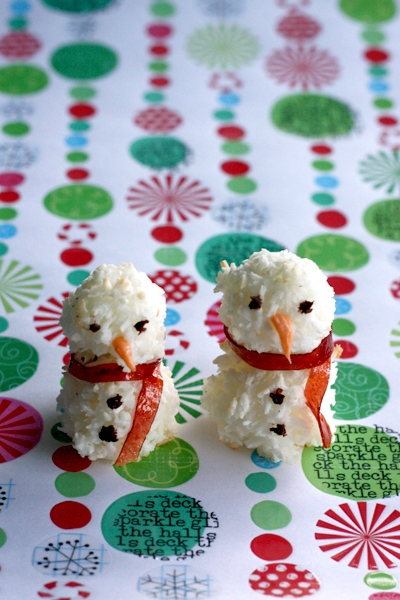 I saved this post for last because even though Christmas is over, as long as it's still snowing (or... still winter if it doesn't snow where you live), you can still make these snowmen macaroons without question. These would make a fun winter afternoon DIY project, an indoor snowman building contest or something of the sort, an alternative to making gingerbread houses. 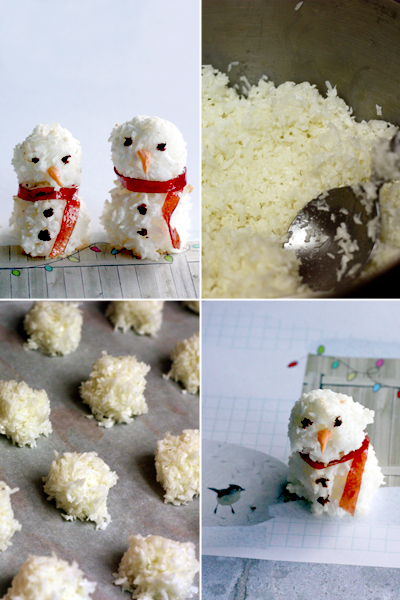 You could set out plates of the baked coconut macaroon heads and bodies, different candies for decorating, and melted chocolate for kids to construct their own edible snowmen. Today, I continue posting about my holiday macarons. What makes these macarons festive is not their flavor, but their appearance. 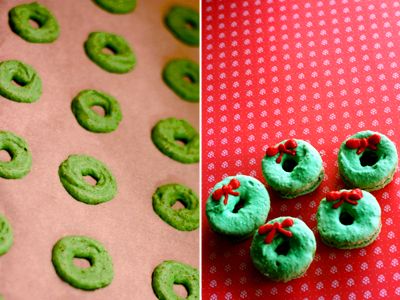 These are my usual pistachio macarons, spruced up to look like Christmas wreaths, which were perfect for my holiday cookie box. 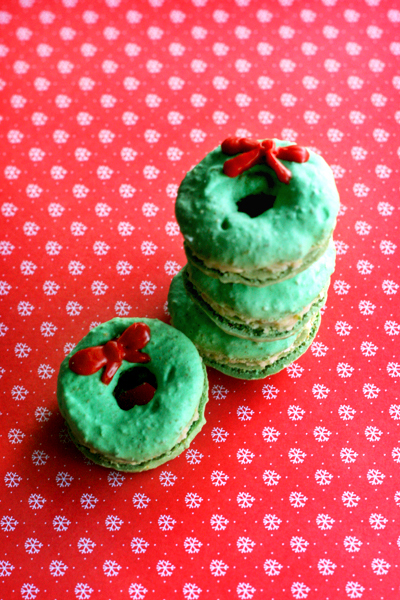 Yup, these macarons are basically normal pistachio macarons with holes in the middle and bows piped on. Interesting how these two small changes can turn a typical round macaron into a holiday macaron. 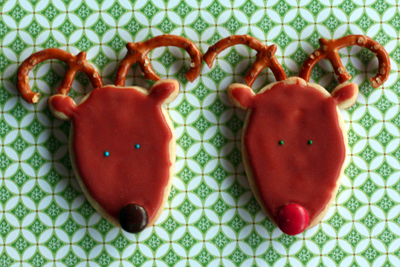 Rudolph, the red-nosed reindeer, had a very shiny nose. And if you ever saw him, you would say it glows... Sleigh bells ring, are you listening? In the lane, snow is glistening. A beautiful sight, we're happy tonight, we're walking in a winter wonderland... Even though Christmas has passed, I still have all these Christmas songs stuck in my head from having my Christmas music on repeat for most of this month. 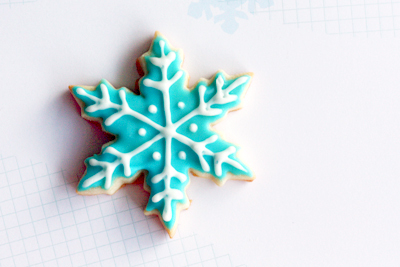 Two of these songs, "Rudolph the Red Nosed Reindeer" and "Winter Wonderland", inspired my sugar cookie designs this winter. 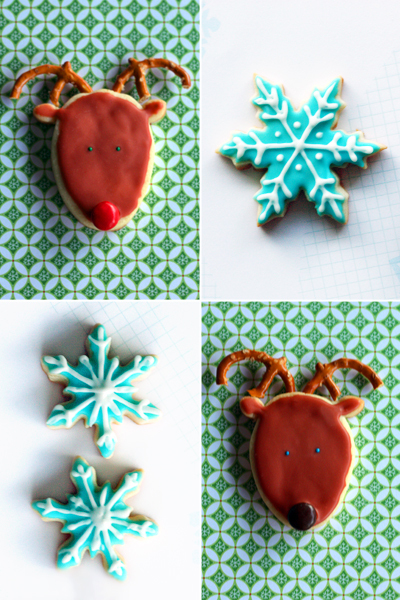 This year, I made reindeer and snowflake sugar cookies. 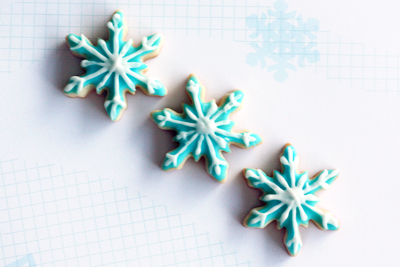 The reindeer are cute, with pretzel antlers and M&M noses, and the snowflakes are pretty, iced in blue and white. Two fanciful designs that fit nicely with the songs that inspired them.